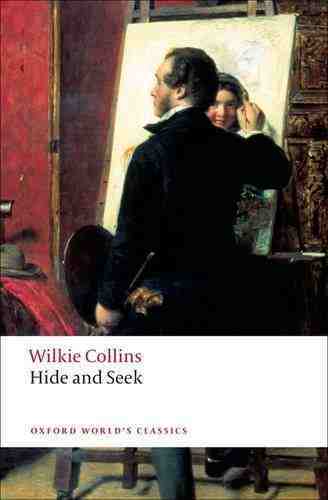 As I mentioned at the end of my Dr Who post, I’ve been reading Wilkie Collins’ Hide and Seek (1854). I love a bit of Wilkie – I read loads of his books in my second year of uni, when I wrote a dissertation about sensation fiction – and every now and again when I want something not too taxing to keep me busy on the Tube I SEEK out (boom boom) one of the ones I haven’t read yet. I have to say, there’s a fairly good reason Hide and Seek wasn’t top of my ‘must-read’ list. Obviously The Moonstone and The Woman in White are the classics (second-level: Armadale and No Name) but I do like some of the weird ones; like Poor Miss Finch (blind girl, blue boyfriend) and The Law and the Lady (secrets in the dust-heap). The thing is, though, that after you’ve read a few of the minor ones it can begin to feel (as Helen pointed out) almost like he’s writing for a bet; as if somebody’s said to him “bet you can’t write one with these two completely arbitrary and dissociated elements” and he’s like “yeah I definitely can actually”. And he does but there’s not really much point to it. In Hide and Seek, there are a few big boxes ticked: the circus, a deaf and dumb girl, a man who’s been scalped (very good one), an eccentric painter and a bedridden wife. It’s all fairly random and the story does nothing to help it hang together cohesively. Essentially it’s a family romance: Valentine Blyth (the painter) adopts a little girl (whom they nickname Madonna) from a circus and nobody quite knows where she comes from. He’s desperate to keep it all under wraps (so nobody comes to take her away from him) but when a mysterious, skull-capped stranger turns up you just know things are going to get interesting. Or at least, you hope they will: in the end it turns out to be a lot of suspense with nothing, really, at the end of it. Without wanting to spoil too much, skullcap man turns out to be quite a sweetie; and the only real jeopardy (the idea that Madonna might be forcibly removed) is dissipated almost immediately. It makes for a weirdly flat ending to the book; you’re almost just reading for the sake of reading by the end of it. There’s also a really weird ending to what looks initially like it will be the romantic storyline, which I won’t spoil but which definitely felt more than a little uncomfortable. Of course, this was written very early in Collins’ career and I think that’s really at the root of it: he has these good ideas about how a story can be driven but he hasn’t quite got the balance right in terms of narrative payoff. 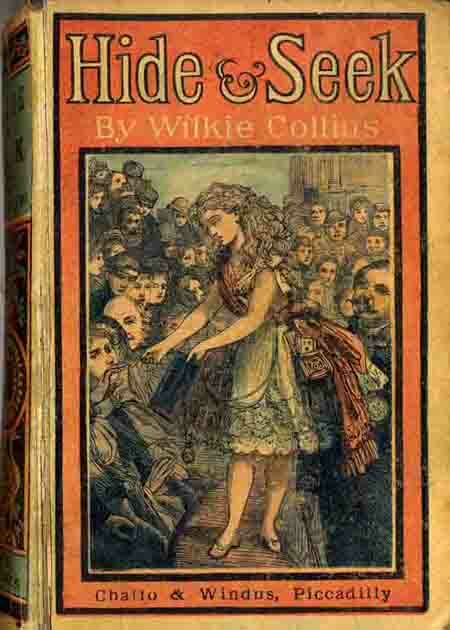 Essentially, then, Hide and Seek is really interesting only if you’re working on one of the topics it covers; if you are into the lives and social circumstances of nineteenth-century middlebrow painters, or the details of how disability was dealt with, or the circus, or (indeed) the art and exchange of the Victorian hair bracelet. 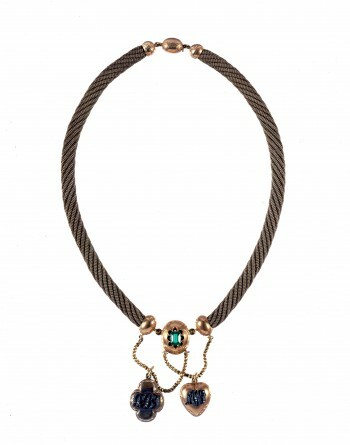 I actually became kind of obsessed with hair jewellery during my Masters’ course; we did some sessions on Book History at the Bodleian library which were basically just “look at all this cool stuff we had”. During one of them, the librarian brought out a bunch of celebrity hair clippings, including an amazing necklace made from the hair of Mary Wollstonecraft, Mary Shelley and Percy Shelley (check out the picture below) and after that my friends and I became very keen on the notion of making a hair brooch from the clippings of all 12 of us on the course to present to our esteemed leader at the end of it. Fortunately for him we didn’t actually do it… but nevertheless, when a ‘Hair Bracelet’ appeared as a crucial plot point in Hide and Seek it did win me over to the book… a bit. It wasn’t enough, though, to make me love it. Jolly as Collins undoubtedly is, I wouldn’t call him a beautiful stylist and without a decently constructed plot to keep things bouncing along, I found Hide and Seek slightly hard work. It’s got elements that are interesting (and a good drinking scene) but as a whole, the book just didn’t do it for me. SORRY WILKO.